A database is the center of almost each and every application; as it offers complete support to internal procedures, customer, sales and marketing teams. I Tech Zone with its substantial experience is keen to deliver their clients with database related solutions and services making sure high-quality performance. The company offers MySQL, access database development as well as SQL database development and other knowledge bases with custom database solutions with technical consulting. We have the pool of certified specialists with a concrete and insightful acquaintance of different technologies. I Tech Zone have an exceptional delivery record and prime focus on developing custom Database solutions. 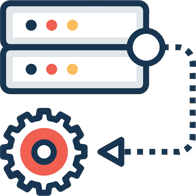 Our powerful database team approaches every direct or indirect database project with an independent database development process. Comprehensive experience in database solutions development is a proof of the company’s professional capabilities as well as competency. We provide a wide range of services in sync with database development through our expertise web application development solutions. We as an expert database development company offer different types of services which comprises of custom database development, database design, database development support, software database development, database consulting, database performance testing, data warehouse, database analysis, database reporting, web database development and database migration solutions. Advanced database design and development solutions enable your business with improved security, increased accessibility and automated backup with expertise database development service. If you need to hire expert developers for your next database development project or want to outsource Database development activities on a regular basis you can contact us. By having a dedicated database development company like I Tech Zone you get access to both an individual expert and a specialist team. We will be happy to share our database expertise in detail with you.